Meet Shii. She’s 17, tall, cute and like to lean sideways. I do believe leaning is something we commonly see in bootlegs but I’m very sure my Shii isn’t one. Do you have leaning figures? Leaning Tower of Pisa and the Leaning Tower of Shii. The next two Wonders of the World. Anyway no, I guess Yoruichi would count, and maybe KOS-MOS but no problems with the latter so far. No plans to get one in the near future either. Dangerous. STRAIGHTEN HER OUT WITH YOUR MAN HANDS. She is testing you like all girls test you. Show her who’s the man, and straighten her out. Do it with warmth, but with confidence. Do it wrong, and she’ll snap and be gone forever. Hang her on the wall, it’ll take time to fix her. I seem to remember reading about fixing a leaning Tohsaka Rin using warm water. Maybe you could try that too. LOL @ fatb’s comment. That is cute true, what he said. @k: Because its made of soft PVC. If there’s a weight difference in the figure, that is, if the center of gravity is slightly off, it would start to lean ever so slightly, and will only get worse over time. maybe u can consider getting this kamina figure. it’s overflowing with GARness. GET! thanks for all the comments and advices. i’m interested to know who has Shii as well and does she leans? currently i place shii with her stretch out left arm against the wall to prevent her from leaning. Shii is terrible at staying sober! I’ve had to adjust my shii figure 2-3 times since I aquired her (about 6 months ago) – quite annoying! My one bends backwards, and one time I couldn’t be bothered to fix her and her left foot was actually starting to peel off the stand – so be careful! @stifler: Alter swimsuit Rin is a notorious leaner; you’re thinking of HappySoda’s tutorial. 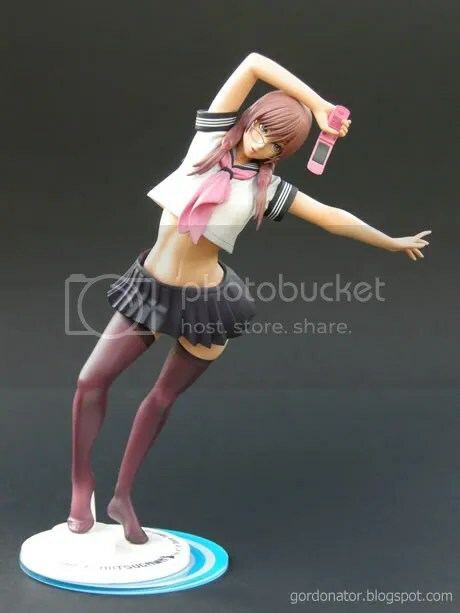 yah, i have 2-3 leaning figurines, and they are 100% original figurine. I’ve got this figure as well and she’s a leaner too. Just fix her with hot water. i did that to mine a few months ago and she’s been as good as new for a while now. nope. it’s part of the base. is Alter Saber + ice crusher one of them? maybe i’ll try using hot water as well. no leaners so far… but that’s prolly cuz everyone’s back in their box for the summer ;_; got paranoid about problems like this so every time the temperature goes up, back to storage with everyone. Well I’ve lucked out so far no leaners. Tho the only one I am worried about being a possible leaner is Chu Chu Astram and she is only a couple of weeks old. I don’t have any leaning figures. I will be keeping a close eye on my Suzu to ensure she doesn’t lean. She looks like she is gonna fall off anytime soon. she can lean on my gundams any time.